The South Coast Vanguard and some Sardine Run bounty. After last years no show the Sardine Run this year has been with low expectation. Every time I have heard of the sardines making an appearance, I have kind of with half interest waited to see if there is any action on the spearfishing front. There were reports of sardines been netted off Pennington on Tuesday, and I heard of a number of guys packing their guns for an onslaught on Wednesday. Well the swell over the weekend kinda ran through to Monday and Tuesday so there has been little spearfishing done. But barrel riding well no thats another story! !The surf was pretty much firing from Saturday to Tuesday mid morning. Every dog and his cat was on it and it was rather crowded, except for Sunrise on Monday and Surfers on Tuesday. Go figure?? Anyway we will have to wait a while before we have a spread of surf like that again. Talking about surf I was chatting Syd Boulanger yesterday about his Zulu Surf Adventures tour company. He has been sneaking off to some spots up towards Mozam and scoring some epic uncrowded surf. I thought I would take a peak at his site and came across this ...... I thought it was pretty funny, and very true! Back to the diving the sea calmed down and I heard some fish came out off Umhloti, a good cuta and some snoek. I have not hear whats happening this side as my head has been in a hole with work. This morning looked great and I am sure some of the guys got in before the east goes and wrecks it again. The weekend looks fairly promising on Saturday morning but dont hold your breath!! Sunday is a write off and early next week looks like some average but good surf. You will probably still be able to dive if surfings not your thing as it does not look like the swell will be that big. 44kg Wahoo .. South African Spearfishing Record? Not only is this the biggest Wahoo shot in SA, it was shot off a shore dive!!! There has been an unpresedented flurry of great fish being shot off shore dives ... but this one tops them all!!!! Brod planted himself at the top off SA's spearo's at nationals and with fish like this well .... no body is saying different!! 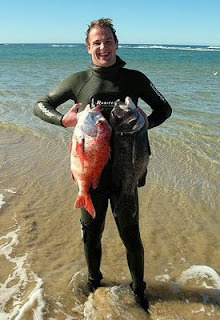 The only thing is that I am not sure Brod has even sent in to claim the South African Spearfishing Record!! A Record never the less!! Here are the links Thanks a mill!! I think us chaps up the north coast are seriously spoilt, I mean the water is generally warm and we can get some seriously good gamefish. Take the last few posts for example ... all very good fish ... and they are big!! 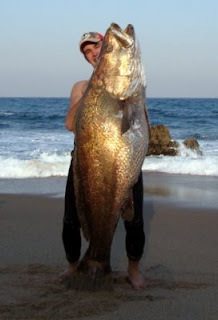 Then on the other hand you have the Eastern Cape, the water is sum what fridged and well you dont often get any big pelagics ... well other than Yellow Tail and Tuna. But for the most part its sneaking around the cracks looking for good reef fish. Terance sent in this pic from a shore dive near Port Alfred, I must say if it wern't for the Miss Lucy and Poensie it could have passed for Mozam ... looking good, but just a tad colder! I have never dived Port Alfred, although I have surfed it and it has some epic waves. Another mate of mine did a surf trip there a couple years back, he took his dive kit along and when it went flat took a boat out to one of the spots. He said the water looked clean but it was very gloomy .... apparently thats normal for there? Anyway he said that on almost every dive he bumped into Raggies, and some of them he had to push off as they were quiet frisky!! So I suppose we have it too good here ... I should stop complaining that the water is 20deg and the Cuta are scars!! Anyway nice fish Terance .... keep the pic's coming. 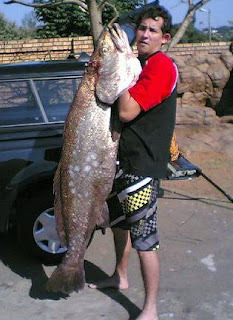 The sea has been good to a few chaps lately, Morne with his 2 good fish out deep and now Cristo with a 41kg Dagga. He must have thought it was Christmas or something!! Went on a mid morning dive on a point on the draining tide and found this giant fish in the shore break. I am not sure of all the details but apparently all hell broke loose trying to subdue this monster. On the surfing front Parko took top honors at the J Bay Billibong Pro.It looks like he was on fire during this event scoring 2 perfect 10s during the event. Dane Reynolds finaly stepped up to the plate also scoring 2 10's and the highest heat score in the comp. He made the semi's but got knocked out by Damien Hobgod who eventually came second. Good news is that it looks like the weekend is going to be good for a dive .... hold big toes and thumbs!!! Maybe I will even shoot a fish!! Nows that for a thought!! 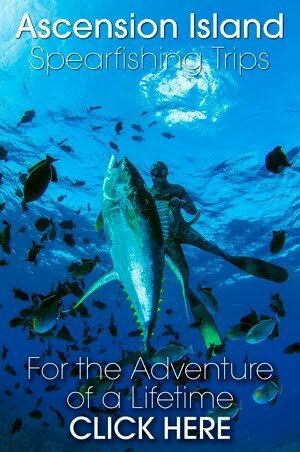 On the Ultimate Spearfishing Magazine front the subscriptions are going very well. We have 250 subscribers already and day 4 has just started!! If you have not subscribed yet just CLICK HERE and get your copy for absolutely nothing .... now there is a real luck if I ever saw one!! Its been less than day since we opened the subscriptions for Ultimate Spearfishings Magazine, and we already have 80 subscriptions .... most of which came in the first hour of opening!! The all african high gloss mag is the first dedicated spearfishing publication in many decades, and will bring all the spearo communities together ..... something that will be an epic accomplisment. So from Spearfishing to Freediving and even underwater hockey we hope to cover it all. 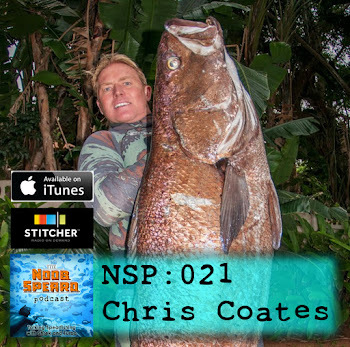 The epic trips and success story's from your home dive spots, to the clubs and guys making a difference in the spearfishing community. At the end of the day we hope to turn up the amp! Get the juices flowing and get a whole lot more diving in!! The best thing of all is that we have found a way through cleaver number crunching and keeping our overheads low .... like operating out of a garage :-) to bring this mag to South Africans for free!! All you need to do is full in this form below and Bobs your gran you get the Ultimate Spearfishing Mag to you post box for absolutly nothing!! Oh and just because we can ... we decided to give one luck subscriber a pair of Xfin blades .....So Tata Ma Chance!! Some would say what a luck!! 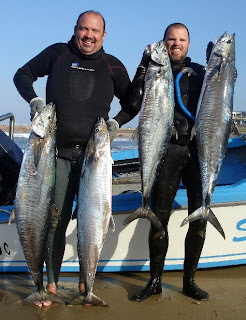 A Wahoo and Cuta both over 20kg and both speared on the same shore dive, and at a spot that is dived alot! Hang I have spent hours out on the drop off and have not come close to this feat. I suppose any great part of fishing has some element of luck to it, but when you consider that when every one was milking the snoek in the shallows for the last few months Morne was on the sand in the deep .... and most times came in with nothing to show for his efforts. So I suppose luck and opportunity were to collide some time. Like Gary Player once said "the more I practice the lucker I get.." or something to that effect! Ok so we have delt with the luck issue ...how about the jealousy??? Gee I am green I can think of a single spearfisherman who would not want to be able to say they got a wahoo and cuta of this size on a shore dive. I mean mates of ours spent the who week down the south coast (were all the action is supposed to be) & with a boat ... they dived all the spots and no 'luck' - nothing!! And back home .... well ...nothing wrong with home!! Anyway now the bar has been raised..... its gonna be a tough one to beat!! For once the weather came through for us, a light southerly blew on Friday and into Saturday morning making the Freedivers Gamefish comp divable. Most of the action was down south, and the winning fish was a 16kg cuta from the south coast. Marcus Potgieter missed it by a day when he shot a 45kg Dagga the afternoon before the comp, it would have been real luck if he had pulled the rabbit out the hat 2 days in a row! We tried a different strategy and tried to go deep up north where the guys had been getting the odd big cuta the week before the big swell. The vis was marginal and it was tough going in the deep. We kinda also hoped that we might bump into a Dagga or 2 but we hit a blank and did not see a fish the whole day. In fact we dived so long by the time we hit the beach it was late in the afternoon. We were finished and did not even make the weigh in! With doing more surfing than diving I really felt the fitness levels were down, its amazing how quick you loose it. I guess we are coming into that time of year where most of the diving is shallow except for that odd Dagga hunt, and we will have to do a couple purpose fulled deep dives just to keep in shape. Anyway thats about it for now ..... keep your eyes and ears open for fish and sard action down south. If you can catch it good it can be amazing!! For those of you who have been following the draft IMP- Integrated Management Plan for iSimangaliso Wetland Park published in Dec 2008. Here is an editorial from the recent edition of Ski Boat Magazine. Click on the link or enlarge the doc.